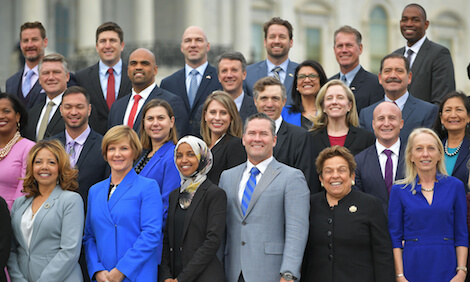 Pictured are some of the newly elected members of the House of Representatives, who gathered for their freshman class photo in front of the Capitol on November 14, 2018. On Election Day, November 6, 2018, voters across the United States turned out in record numbers to cast their ballots in the midterm elections. The midterm elections are always held halfway through a President’s four-year term. The midterms are important because a large number of seats in the U.S. Congress are up for election. Many states also have races for governor and other local offices. The results of the midterm elections across the country have caused a shift in power in Congress. The Democrats have won control of the House of Representatives, while the Republicans have kept their majority in the Senate. The midterm results have also brought more diversity to Congress. In January 2019, when members of the new Congress meet for the first time, there will be more than 100 women serving in the House of Representatives, the largest number in history. With the addition of the more than 20 women who will be serving in the Senate, the total number of women in Congress will also be record-breaking. The midterms brought many other historic firsts for Congress. At age 29, Alexandria Ocasio-Cortez, a Democrat from New York, became the youngest woman elected to the House of Representatives. Democrats Rashida Talib of Michigan and Ilhan Omar of Minnesota became the first Muslim women elected to the House. Omar will also be the first Somali-American member of Congress. Sharice Davids of Kansas and Debra Haaland of New Mexico will be the first Native American women to serve in the House. California Republican Young Kim became the first Korean-American woman elected to Congress. Ayanna Pressley and Jahana Hayes will become the first African American congresswomen to represent their respective states of Massachusetts and Connecticut. Colorado Democrat Joe Neguse is the first African American to be elected to the House from his state. Republican Marsha Blackburn of Tennessee and Democrat Kyrsten Sinema of Arizona became the first women elected to the Senate from their states. The newly elected members of the House and Senate are scheduled to be in Washington, D.C., in January to be sworn in. They will then begin working with their colleagues to make and amend legislation, or laws, that will have an impact on all Americans. The new Democratic majority in the House could make it difficult for Republican President Donald Trump to achieve his goals in the second half of his term as President. The Democrats in Congress disagree with his ideas about how to run the country. They have a different set of goals, which include passing laws to increase gun safety and make voting accessible to more people. Still, some members of both parties hope they can work together and make progress in areas where they can agree. How many women will be serving in the House of Representatives in January 2019? Which states elected women to the Senate for the first time in the 2018 midterms?